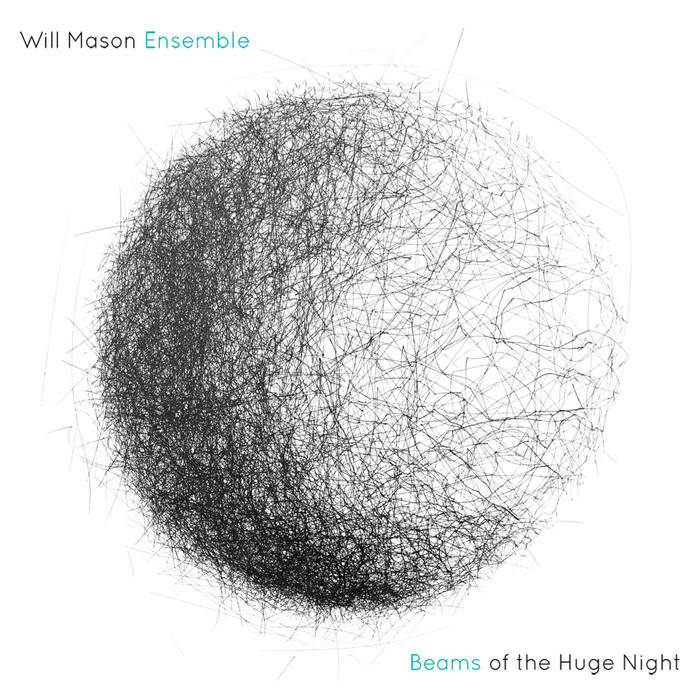 Will Mason’s ambitious debut album is the product of equal parts isolation and collaboration. According to his website the 26-year-old drummer/composer, a doctoral candidate at Columbia, holed up for two months in a remote Maine cabin without water or electricity to write Beams of the Huge Night. But before it could be recorded, the music—which is demandingly detailed, complex, and muscular—had to be hammered out in live trials with the help of the rest of Mason’s ensemble: Stuart Breczinski on oboe, Daniel Fischer-Lochhead on alto sax, Nina Moffitt on vocals, Travis Reuter and Andrew Smiley on guitars, and Dan Stein on upright bass. Finally, a month of mixing followed the three-day studio session. The result of this extended process, from pencil-and-paper composition to post-production fine-tuning, is an impressively balanced first statement from a bold new voice—full of confidence, free of ego. The album opens with “Finn,” a sixteen-minute tour-de-force that showcases many of the contrasts to come over the album’s six tracks: quiet meditations against math-rock grooves, intricately braided horn and guitar lines against crystalline vocal syllables, chaotic group improvisations against studio manipulation. Forced as these dichotomies may be, they help suggest the breadth of Mason’s compositional abilities and at the same time the focus of his conceptual vision, as each individual element is angled toward evoking the sense of “awe and unease” Mason cites as central to the experience of nature he wants to represent onthe project. While “Finn” takes its time gathering energy, the shorter follow-up “Door 6” kicks off with a crunchy odd-meter workout that feels lifted straight off of last year’s Zevious album—until Moffitt enters with melancholy phrases that would indeed be aptly described as “beams” cast against “the huge night.” The well-placed next track, “Door 7,” takes the rhythmic rigor down to a more subdued place with Mason on brushes, though in the final few moments the feel shifts to a snaggy Afro-Cuban groove overlaid with insistent staccato horn and vocal patterns. The album’s second half features two pieces dedicated to small Maine towns Dixfield and Strong. The former is another extended, hydra-headed beast—fifteen minutes of ambient exploration, airtight off-kilter drumming, saxophone blowing, and trance-inducing drone, all topped with ending worthy of Steve Reich (think New York Counterpoint). But if my insufficient descriptions have you wondering whether Mason isn’t simply tossing unrelated fragments together and calling it composition, take the special opportunity to read his essay about the latter Maine piece, which offers rare detailed insights into both his inspiration and his complex writing process. This generosity—and I mean not only his dedication to teaching and paying knowledge forward, but also the way he’s stuffed Beams of the Huge Night full to overflowing with ideas and delights—is a sign, I hope, that Will Mason has a lot more to give us.